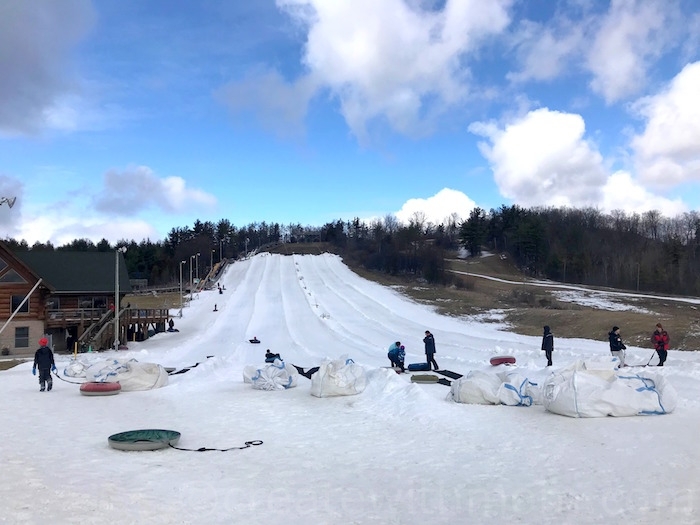 We really enjoyed snow tubing down the 250 feet high, 900 feet long slopes at the Chicopee Tube Park located in Kitchener, Ontario. To make it to the top of the slopes, we have to walk half way up, then take the magic carpet to the top. This makes it easy to get up to the top of the slopes, and tube down multiple times. We can tube alone or go with a partner down one of the six chutes. Even children will be able drag the lightweight tubes on their own and make it back and forth on their own. We found the staff at Chicopee Tube Park very welcoming, and accommodating. They were more than happy to give a spin or let the riders get comfortable if we decide to ride together and give a push each time. There is parking at the location, washrooms, and helmets for rent. There is a lot of space at the heated lodge which overlooks the mountain, where we can relax and enjoy a snack at their café, or even host group events and birthday parties. We loved that everyone was out there to enjoy the slopes and have fun, which made it more memorable! Get your winter gear on and check out the Chicopee Tube Park website for details on prices and location. Looks like a fun day by all ! Never been at any Tube Park before, looks like fun for both adults and kids! I haven't been tubing in over 20 years and it's so much fun! So much fun! I haven't been tubing in many years. Great times. I've never been tubing, and I'm not sure I'd want to try it at my age, but it sounds like fun. This looks like fun and would make a nice day out for us! I remember going tubing in my younger days and the endless fun it brings.Love to d it just one more time! 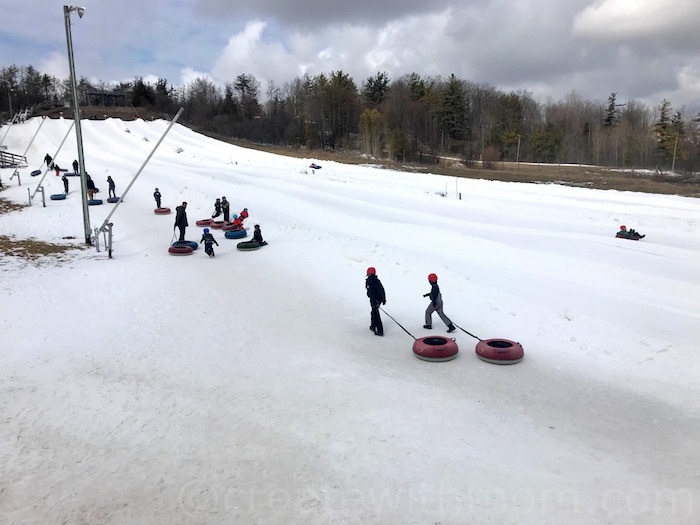 I've never been tubing, but I know that my grandson would LOVE it, will have to tell my daughter about Chicopee Tube Park, thx very much for this terrific review! If I was younger and didn't have so much pain I would totally be doing this, soooo much fun!! That looks like so much fun!! There's no where near here to go tubing, but i know hubby would have a blast with the kids. Tubing looks like so much family fun! Living here in Victoria, we very rarely experience snow fall that can be useful (for fun) I love this!!! I have no idea how I didn't know about this! The kids used to toboggan at a local park here but it's been banned. Our son would love this and I know my husband and I would too! Thanks for sharing, looks like a perfect winter break day! We go sledding but we've never gone tubing. This looks like so much fun. you are way braver than me lol glad you had fun. I would love to try this. My boys would go crazy for tubing. Looks like so much fun! This place looks like a ton of fun! I think my family would enjoy it. Glad you all had a great day!! I would love to take family to this park. I would love to bring my boys here. We have never tried tubing but I know we would love it! I'm not a big fan of thrill rides but I think I would enjoy this. This would be a fun winter activity for the whole family. I remember doing this with my boys when they were young, always a good time. I would love to try this again sometime but I don't think my body will allow it! I would love to try this one day. Looks like it would be fun. 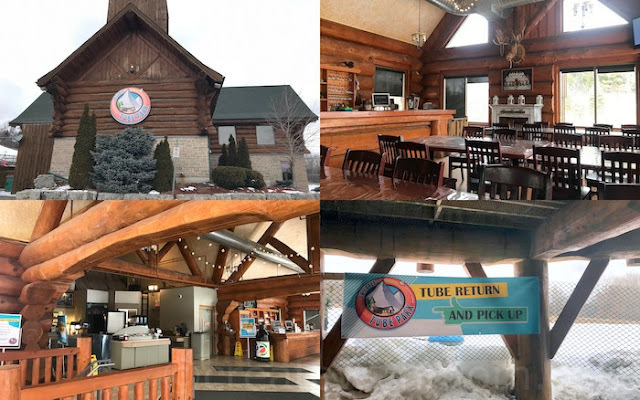 love tubing, looks like a wonderful place! My boys have never been tubing. This has to change. Wow,900 feet long slopes that's a nice ride! such a fun place! love tubbing! If I showed my boys this post, they would be begging to go! Such a fun winter activity ! It looks like so much fun. My kids would love it. My family would have such an amazing time here, we will have to check it out! I'm happy they have 6 chutes. More fun for everyone and less lines. I didn't know this was in Kitchener! That looks like so much fun...I think I may need to invest in some tubes this year! 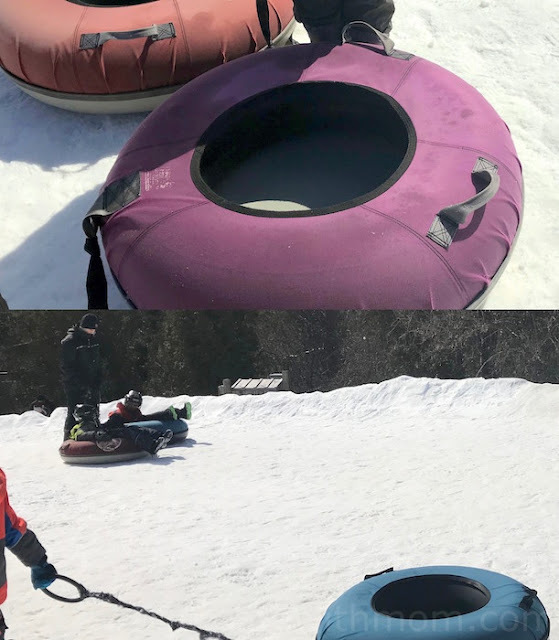 Tubing is s much fun for the whole family ! It just started snowing here. We have to go tubing this year. This place looks amazing. Wow,they certainly have nice long slopes! Tubing with my boys would be so much fun. This would be a nice family outing. Something fun to do in the winter. I remember going tubing it was such fun!